solutions at the exhibition in January 2014. 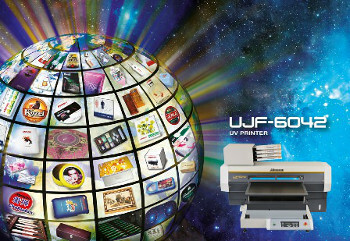 Mimaki is to show its UJF-6042 printer at PSI in DusseldorfIt has just been announced that Mimaki Engineering Co.,Ltd. will be exhibiting at PSI in Dusseldorf, the leading European promotional products trade show. The event kicks off 2014 for the promotional products industry and will run from the 8th to the 10th January, 2014. Mimaki has said that it will be offering attendees a hands-on opportunity to produce their own work on Mimaki printers during the show, which undoubtedly will be of great interest to may people. All the latest technology for the promotional products industry will be featured by Mimaki at the exhibition, including the UJF-3042 and UJF-6042. The company highlighted the fact that the UJF family of flatbed printers achieves a more precise and vivid image quality that is normally only found in more costly printers. Reaching 1800x1800 dpi resolution and a variable dot with a minimum size of 4 picolitres, it ensures smoother gradations. Quality can also be enhanced with the application of glossy or matte finish clear ink, and multi-layered print can be achieved by overprinting an area several times. The UJF-3042 desktop flatbed printer has a print area of 300x420mm, while the larger UFJ-6042 handles sizes up to A2. Both offer environmentally friendly LED curing, 6-color process colour, multiple ink options, and the ability to print on substrates up to 150mm thick. Mimaki will also be demonstrating its JV33 Series printers which it markets as an affordable, high performance, roll-to-roll multifunction inkjet printer featuring high quality output at up to 1,440 dpi with 4- or 6-colour printing. It supports multiple ink types, including two solvent inks with high scratch resistance, high density, wide colour gamut and a high safety factor. Users may also choose to use aqueous pigment ink or dye sublimation ink at the time of installation. Mimaki will be located in a 107 square metre stand in hall 12, stand B13 (Technology Forum) of the PSI Show.